This photo was taken on May 23, 2014 at 11:22 AM. 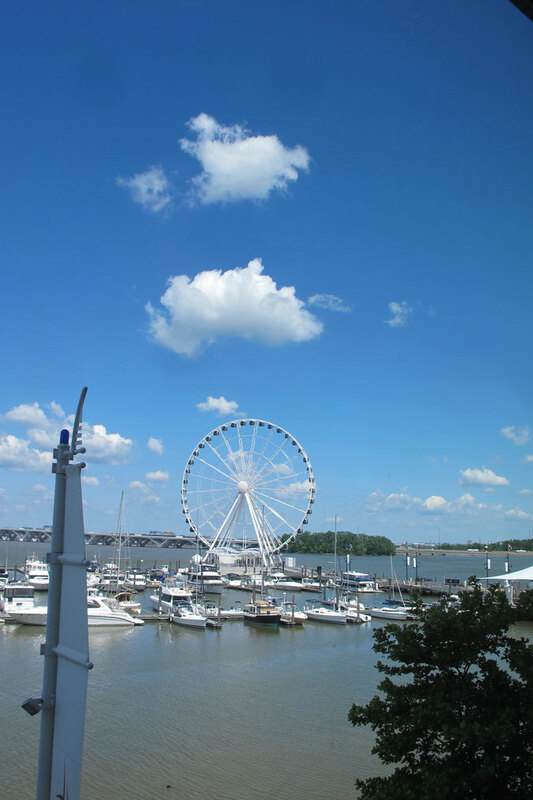 The location was at National Harbor Maryland, near Washington DC. The "Take It!" Came after having taken a ride on the first day of being open to the public for this cool attraction. I took many photos on the way to, during, and after the ride that were close up and some of them rather unusual. This photo was sort of a, just one more, when one has not quite gotten enough of a good thing. The After Take: Came when I went to the camera store to make prints from the run of photos I had taken, which I like to do after every several weeks to try to keep current. I was quite pleasantly surprised to see how the clouds had lined up above the Ferris Wheel. While I know this was merely one more splendid act of nature - I could not help but think this might just be some cosmic occurrence designed to give a special welcome to this great ride that will thrill and delight many, many people, hopefully for many years to come. I of course hope that all who were in the area on that day at that time saw this bit of wonder - but for those who were not - I feel ever so fortunate to have caught the event and even more so to be able to share it. Wishing you all a wonder filled day. Thats bigger than I thought it was. What a beautiful photo! I agree amazing looking day, must've been nice to be outside. Wow that thing is right on the water. Really cool! I bet that is a great experience. I'd love to go to the top and just stop it so I can see all the cool views. for sure doesnt look like a temporary wheel. That one is going to be there for awhile. If i ever make it out there to visit taylor, I will have to give it a ride.